I have currently been studying over human communication and interactions in my psychology class and i agree that there are a lot of groups who display ethnocentrism to others. I have learned in my class that people’s reactions or views towards others are determined by their perceptions of them and not by who they really are. It’s like the famous saying “judging a book by its cover”. There has be reasons for why certain groups gather together and stay away from one another through social categorizations. I don’t understand how ethnocentric agents do better than selfish agents. In the prisoner’s dilemma, it is always more advantageous to defect. If agents know how agents have been behaving in the past, that’s a different story, as well as if the tag provides information about their strategy. But that’s not the case here, right? Reading them, I thought the tags and the strategies are unrelated. Something like “The agent is defined by 2 traits: the cell she inhabits and her strategy. Her tag is a bijective function of her strategy” would have been clearer to me. Then, thinking about it, in real life, tags are not immutably linked to strategies. 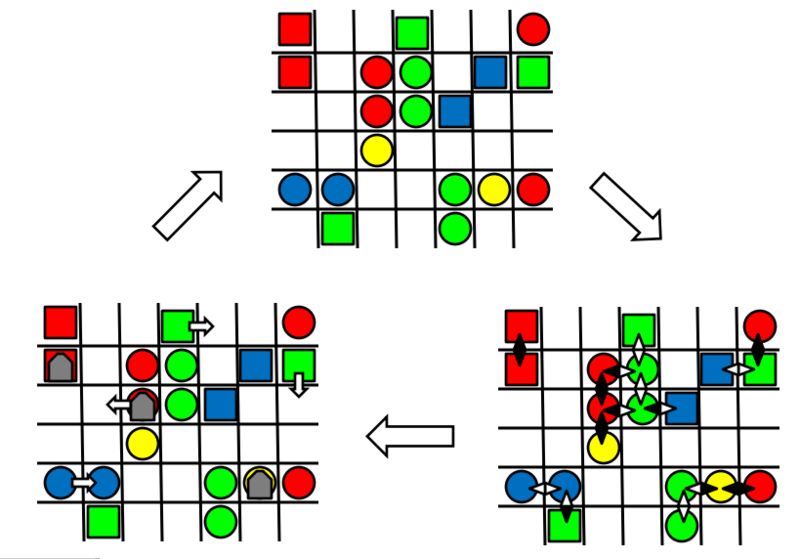 How does the model react to, for example, occasional mutations that change the association between the tag and the strategy? That’s the whole point, Stephane! The tags and strategies are independent, and on first thought it seems like selfish agents should do better. The point of the research in evolution of cooperation is to show how this can be overcome. Think about it this way: sure a selfish agent does better if they get to interact with the same agents as a non-selfish. But is this obviously the case? Well, let’s look, what does doing ‘better’ mean in an evolutionary setting? It means the agents gets to produce more children, where do these children get placed? Next to the agent (since this is a spatial model). So the agent then has to interact with its own off-spring, getting a very poor payoff. Thus, selfish agents (and traitorous ones) are extremely self-limiting because small clusters of them can’t grow larger. Of course, if the world was inviscid (if we didn’t place children next to their parents) then indeed your intuition would be correct. In an inviscid environment selfish agents would be the dominant strategy. Aha! Thanks for clarifying. Indeed, my reasoning failed to take locality into account. I was imagining mobile agents, for some reason. The paper I have in mind is bit different from the original model. But it might be be an explanation why children should be placed around their parents. As you pointed out, the reason that etho agents does better is because selfish people can not grow very large. 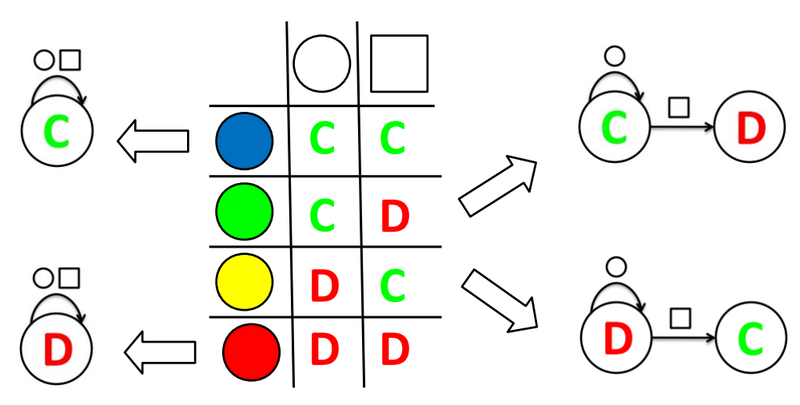 In Schelling’s segregation model, agents are allowed to move. and if they perceive their own type fall below certain percentage, even a very low one, then they move. in equilibrium, you would observe racial segregation, meaning different types of people would live together. Can you provide a more detailed summary of Schelling’s model or a reference? The details of these models matter a lot, especially since a lot of modelers hide very important things in their assumptions. For instance, a lot of the early models of ethnocentrism (for instance Riolo, Cohen, Axelrod 2001) did not allow selfish, and traitorous agents because they assumed the agent HAD to cooperate with those like it and could only adjust its level of tolerance (but even at zero tollarance it cooperated with those of exactly same tag). Thus, these early models could not show the evolution of ethnocentrism, since they pre-supposed it in their constraints. If Schelling’s model has the “if they perceive their own type fall below certain percentage … then they move” feature coded into the agent’s strategy then showing segregation is not an interesting result. If they assumed that agents want to move away from those not-similar-to-them and then showed that the equilibrium is agents not near those not-similar-to-them; that would not be a very exciting result. So you really need to be much more precise about how you describe the model. However, if you write a blog post (on our blog or yours) summarizing Schelling’s model and results then I would be very eager to read it! Unfortunately, it is as I described it in my comment. Thus it is not of much interest to me, since it really presupposes its outcome in the direct wants of the agent. “Low” is not a precise term. How is 1/3rd low? It is a rather arbitrary judgement. In general, you would expect that parameter to only effect the noise level and time to equilibrium (since it is the only real timescale in the model, apart from the discretization). But we can discuss the model in more detail after you blog about it. It unfortunately doesn’t have much to do with our game-theoretic approach in the H&A model. This is a really good example of social categorization and its effects. I found it interesting that the blue icon player really did better. It seems that there is a common belief that most ethnocentric people accomplish more for their group, whatever group that is. Good work! 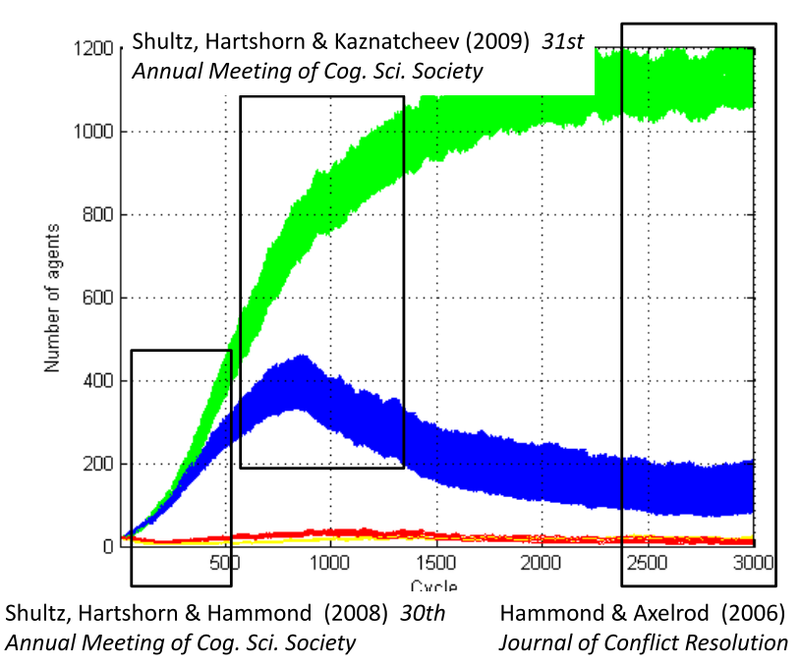 I was also surprised to see that ethnocentric agents maintain higher levels of cooperation than humanitarians in the prisoner’s dilemma. However, it is unfortunate that ethnocentrics in the harmony game go out of their way to hurt other groups, as opposed to simply helping there own. I would expect higher levels of cooperation without tags in the harmony game, but we have not tested it closely. One of the questions that remains from the point of view of mechanism design is to ask ourselves: what kind of constraints can be placed on the system to allow humanitarian agents to be more common that ethnocentrics without sacrificing general level of cooperation. I do not have an answer for this, but I am definitely working on it! Reblogged this on Mediocre Blog. Looking at an article, he has looked at the theory that helps people understand the evolution of ethnocentrism and how it relates to how we think of favoring one group over another while it may negatively impact specific people. This theory basically shows how there are four main types of people, Ethnocentric, humanitarians, traitorous and selfish. Now the article more or less focuses on the ideology that through the years, the overall belief in how ethnocentrism has evolved into something different than what most people would consider today. I do believe that there is a large evolution that has occurred over the past thousand years with the idea that people will always favor their own people over another group. This is very prevalent in many societies today and especially in many large cities today. People not only prefer to be around a sub-culture that they can easily relate too but look down on people who are also in a part of a society that they feel certain people should leave their group because it doesn’t make sense for a certain person to be a part of that society. This really is the biggest negative connotation considering ethnocentrism. I believe that looking at the model by Hammond and Axelrod it is easily identifiable that there are three main factors to consider when looking at ethnocentrism, which are interaction, reproduction, death and placement. Considering that there are definitely more factors to consider these definitely are the most notable and are easily identifiable in many different societies. Interaction would be the biggest factor in the evolution of ethnocentrism because not only has we learn more about a culture anyone in the world but humans don’t consider why the people are the way they are, but only consider why we should change their beliefs. Even though some people may even go as far as to live with certain people in different culture, they still may never fully understand why people are the way we are and it leads to many humans looking very closed minded. People in most cultures constantly judge and never take a step back and consider that when you compare the two people that have more similar traits than uncommon. The problem with ethnocentrism is the people. It is not the idea more or less that people will never understand why a culture or belief is prevalent in society but it is almost entirely the idea that people may never want to understand because they were raised to believe and think only one way. Without people being able to be raised differently it becomes very hard to change ethnocentrism and that is why it will always be evolving.